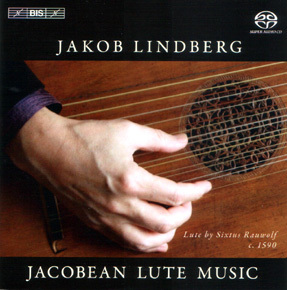 It could have easily been titled "Jakobean Lute Music"….an excellent survey of early -17th-century English and Scottish lute music…..excquisite rivulets of feeling from every phrase. A lovely disc ... it covers a remarkable expanse of musical forms and feelings ... It reminds us in the best way of the role of the lute in this period ... This is just the best way to present the instrument ... Lindberg's touch is so beautiful, his imagination is so clean and pure that you're fascinated ... A big thumbs up. This is such a wonderfully representative collection of English lute music; I would unhesitatingly recommend it, along with a handful of others, if you could only buy one, ever. All is beautifully played and assembled. A total winner…Lindberg's such an expert we almost take him for granted, but after three decades of recording albums…he is still a master of the instrument. …What more can you ask: the combination of Jakob Lindberg, 81 minutes of playing time and a rare 1590 instrument; not to mention the superbly atmospheric SACD sound. ..what really impress are the security of his playing and the maturity of his interpretations of both the serious and more jolly pieces. His sensitive and beautifully paced account of Johnson's long, intensely melancholy Pavan ….is especially interesting. Along with Dowland's A Fancy and Sir John Langton's Pavan, which open and close the programme and Bacheler's La jeune fillette, it is a high point of the programme….A 'must buy' for anyone interested in the lute or the music of the Jacobean era. In a meticulously voiced recital that moves between court, theatre and tavern, from music of great sophistication to music of extraordinary bluntness, Lindberg conjures an age that was as perilous as it was rich in musical invention...........The technical challenges of Dowland's divisions (Battle Galliard) and Daniel Bacheler's exquisite variations (La jeune fillette) are skilfully handled and sweetly turned. Lindberg's selection of anonymous airs is of particular interest, from the bleak and spare A Scottish Tune to the seductive Draw Near to Me and Love Me.